How does my client pay? 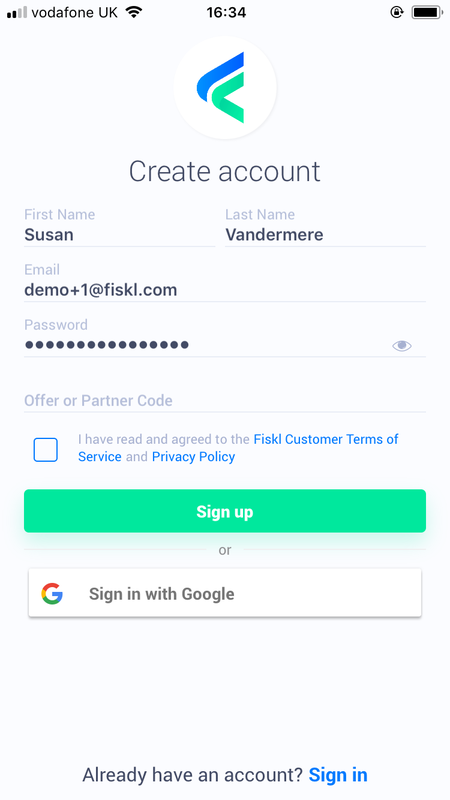 Helpful tip: You can sign up to Fiskl using your Google account and then continue to set up your organisation on Fiskl. Company name or your own name if you are self employed. Select your preferred currency by tapping the drop down . arrow for a list of all worldwide currencies. Select your industry from the drop down arrow . If you have an offer or Partner code, enter it here. Click on Create account and congratulations you now have a Fiskl account! You’ll be taken to a welcome screen where you can finish completing your profile with your address, add your company logo or select a logo from our library, however if you prefer to come back to this later just tap on the button. Open your Fiskl app, enter your email address and password, then tap on Sign in. If you’ve forgotton your password, tap on Forgot password and we’ll send you an email with details. Helpful tip: You can also sign in to Fiskl using your Google account. Now you are all set, let’s have a quick look at where we’ve placed things in Fiskl so you can find your way round without any fuss. Homescreen: A handy overview of your company’s sales, invoices, expenses, your upcoming payments, tasks and events plus a lot more. Sidebar: By clicking on the Fiskl icon menu appears allowing you to switch between different areas of Fiskl. Quick create: By tapping on the homescreen, you can create new items such as a new invoice, expense, mileage and more. Notifications: Provides useful reminders such as expected or overdue payments, recent Fiskl activity, along with new features or updates for Fiskl. Helpful tip: you can also access the User menu by sliding from the right hand edge of the phone towards the centre, the menu will then appear. Having read this introduction, you’re now ready to jump into each area and understand each one in more detail. Let’s go! Peru Nuevo Sol PEN S/. Serbia Serbian Dinar RSD Дин. The homescreen is the first thing you’ll see when you sign into Fiskl. 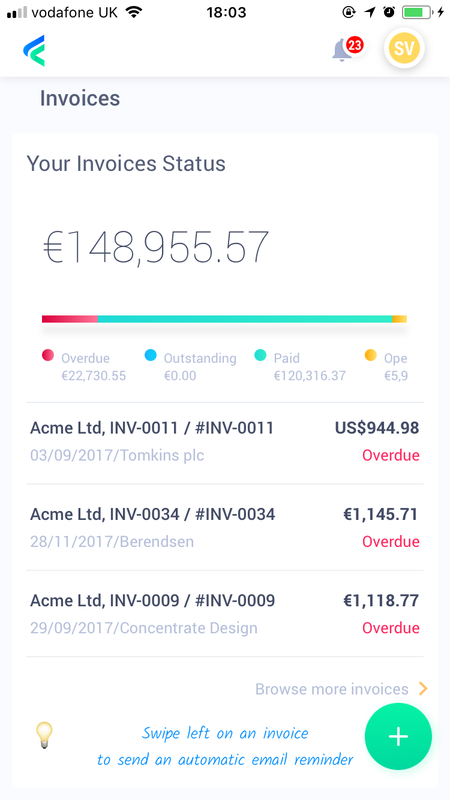 It gives you a picture of your company’s finances, upcoming payments, outstanding invoices, expenses, upcoming tasks and events plus much more. 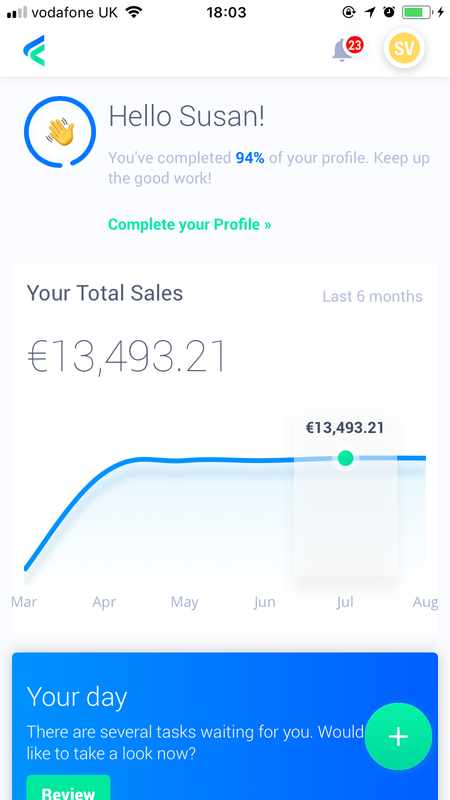 Your total sales graph: This depicts your total sales for the last 6 months, by tapping on the line of the graph above the month, you can see the total sales for that month. Your day: This is your plan for the day, on initial sign in, you can add your first task by tapping the green action button. If you have tasks or events already scheduled, tap on the green action button to review. Recent activity: This shows what you have recently done on Fiskl. List of your invoices: This shows the top 3 overdue or outstanding invoices along with the name of the invoice, invoice number, date and status. To see all overdue invoices tap on “browse other overdue invoices”. Helpful tip: Swipe left on your overdue invoice to send a payment reminder to your client. The revenue and expenses section displays the total revenue for your organisation. It shows the total net figure (total sales minus expenses) for the last 6 months, with figures underneath for total revenue and total expenses for that period. 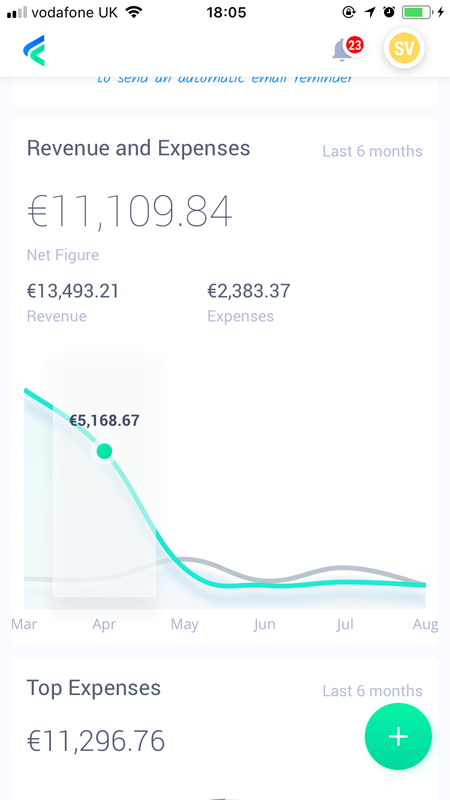 The graph depicts the revenue and expenses for the last six months, by tapping either of the lines on the graph above the month, you can see the relevant figure for that month. The top expenses section displays the total expenditure over the last six months, along with a pie chart and breakdown of the top 6 expense categories for that period. The upcoming invoices section displays the total amount expected from upcoming invoices for the next 6 weeks. The graph depicts the value of upcoming invoices per week, by tapping on the bar for any given week you can see the relevant figure for that week. In company settings you can enter information about your organisation such as contact details, accounting information, your tax type, invoice languages and currencies. Once completed, this information is automatically pre-filled where and when needed across the app. Within company settings you can add your company details including uploading your logo, tap on the fiskl icon for the sidebar sliding menu and slide the bar to the left and select the edit icon next to your company details. Company Logo: Your logo image will appear on all your documentation such as your invoices. You can insert it by tapping on the placeholder ( ) you’ll be prompted to either take a picture using your mobile or select an existing one from your gallery. If you prefer not to add a logo, your company initials will be used by default . Name: This can either be your company name (or your own if you are self employed). This field will already be pre-filled using information you entered on signing up, it can be easily edited from here if need be. Company email: This is the email you will use for all business transactions through Fiskl. Company phone: This is your preferred contact number for all calls relating to your company. Currency: This is the currency that you will use across the app. Again, this is prefilled, to change it, click on the down arrow and select your currency. Industry: This will already be pre-filled as before, to change it, click on the down arrow and select your business type. Address: To enter your address, tap on the small arrow on the right hand side, and enter your details. Tap on the back icon to save and return to company settings. Once your company settings are complete, press save at the top right corner. Within company settings you can add your accounting information, tap on the fiskl icon for the sidebar sliding menu and slide the bar to the left and select the edit icon next to your company details. Registration number: In case you wish to display your company registration number on your invoice you can add it here. This is your registration number for your company and is country specific. Tax/VAT number: Enter your Tax/VAT number in case you are required by regulation to show it on your documentation. Add custom Tax ID label: If you need to display a different Tax label on your invoice, for example GST, ABN, then enter the relevant initials into this field and the initials will then automatically appear on the invoice before the clients Tax/VAT registration number. Fiscal year end: Tap on the calendar icon to select and save the date of your financial year end. Sales Tax/VAT filing frequency: Use the drop down arrow to select frequency of your Tax/VAT filing. Sales Tax/VAT filing start date: Tap on the calendar icon to select and save the date of the start of your Tax/VAT filing. 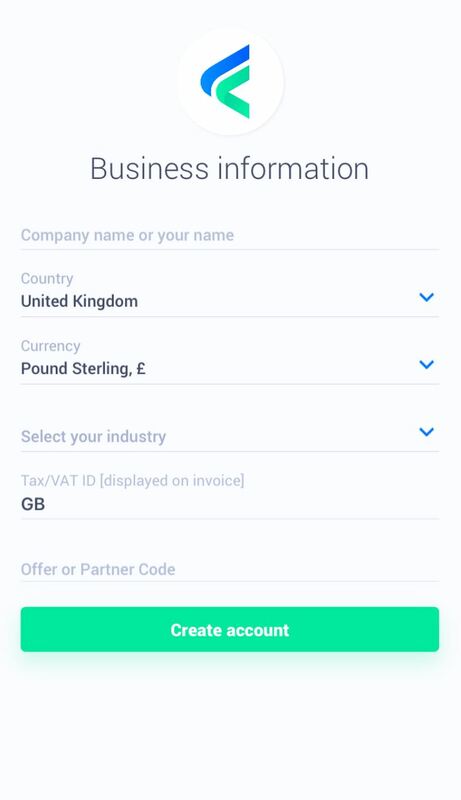 Within company settings you can create or remove taxes and customise how you show your tax on your invoice, tap on the fiskl icon for the sidebar sliding menu and slide the bar to the left and select the edit icon next to your company details. To edit existing tax: tap on the required tax and a pop up box will appear for you to edit the Tax/VAT name and the percentage amount, press save to change the tax in the list. To delete an existing tax: swipe item from right of screen towards the centre, a delete button will then appear. To add a new tax: select “add new” at the top of the screen, this brings up a pop up box, enter a name for your new tax/VAT, then the tax/VAT percentage and press save. This new tax will also be added to the existing list. Tap on the small arrow on the left to return to the company settings. Custom Invoice Tax Label: If you prefer to customise your tax label in the invoice, then just enter the label name, for example GST, VST, HST, this will then appear in the relevant tax fields in the invoice sent to the customer. Add a new invoice, click on the gear icon to go to invoicing settings and select Tax Settings, here you can click on the drop down arrow to select your tax type. For the purposes of this exercise select Multiple and save. Add an expense item to your invoice, to the apply multiple taxes simply click on “add tax” within the expense form, the following options will appear, for multiple taxes make sure Simple is selected, you can then add upto 4 taxes. Once you have added your taxes, click on the Minimise tax section, the taxes will then be minimised. If you change your mind and wish to add a compound tax, simply tap on “simple”, the Compound option will appear, here you can add two taxes. If you wish to delete any of the taxes you entered, just click on the down arrow and select none, this will then remove the text. Helpful tip: By setting your default taxes Fiskl will then always calculate your expense taxes automatically when needed. Within company settings you can add default text that you would like to show in your invoice as well as set default payment terms, tap on the fiskl icon for the sidebar sliding menu and slide the bar to the left and select the edit icon next to your company details. Payment info: Here you can add your account and payment details, this will automatically appear on your documents such as invoices. Payment terms: In order for your invoices to automatically enter the payment date, enter your payment terms in days and Fiskl will calculate your payment due dates for each invoice. Manage categories: If you would like to add a category, simply tap then “add new” at the top right of the screen to enter the details of your new category. If you would like to delete a category, simply swipe to the left on the category and tap on delete. Notes: Pre-filled by default with “Thank you for your business” which will appear on all your documents such as invoices. This can be easily changed by tapping in the field and typing in new text. Payment Terms (Days): Enter your standard payment terms in days, when you start a new invoice, the due date will be automatically set as per the days entered here. In Fiskl you can easily send invoices in 60 languages (see Available languages section within this guide, in Company settings you can both add your own default language or customise it to suit your requirements. To select a pre-set language from our language list, go to Company settings, tap on “Manage languages”. Tap on the to bring up the list of 60 languages, either scroll down alphabetically or use the search bar, select your required language and tap to go back to Company settings and press “Save”. The fields in the Invoice PDF will automatically change to your selected language. If you would like to add a new language or customise an existing one, go to Company settings, tap on “Manage languages”. 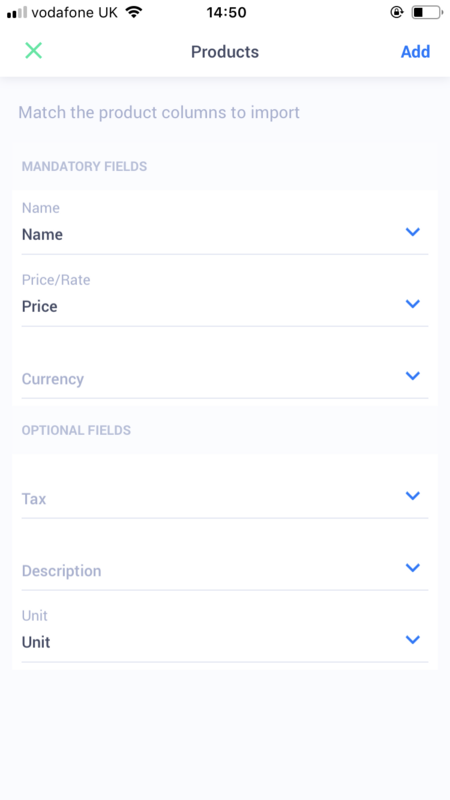 Tap “Add new” and select a language you are familiar with, this will then bring up a list of all the invoice fields which you can edit to fit your preferred language. Assign your translation a name and save. The fields in the Invoice PDF will automatically change to your new custom translation. Helpful tip: If you switch between languages for your invoices, you can apply your preferred language within the invoice settings of your invoice (see Change the default language for your Invoice section of this guide). If you have a team then its easy to share the workload, if you have owner or admin rights you can invite, activate, edit users and assign each one with a role containing relevant permissions. User: Can create and view items (time, mileage, expenses and products/services) that the user has raised. Helpful tip: You can invite your accountant to Fiskl by giving them admin rights. This only applies if you are the owner or have admin rights. Tap on the Fiskl icon to bring up the sliding side bar, slide the menu to the left and select Manage users. The initial screen will show a list of all users along with their role, email address and pending (user hasn’t replied to invitation). Tap to add a new user. Email address: This is the email address for the new user. First name: This is the full name for the new user. Last name: This is the surname for the new user. Assign role: Tap on the small down arrow to select from a list of roles (permission levels), these are: Owner, Billing user and Admin. Inviting the user: If you wish to save and send an invite to the user, press send at the bottom of the screen. The new user will receive an email asking them to create a password to access the account, you will then receive a notification confirming that your new user has accepted your invitation. Helpful hint: You can add multiple users by tapping on “add another”. 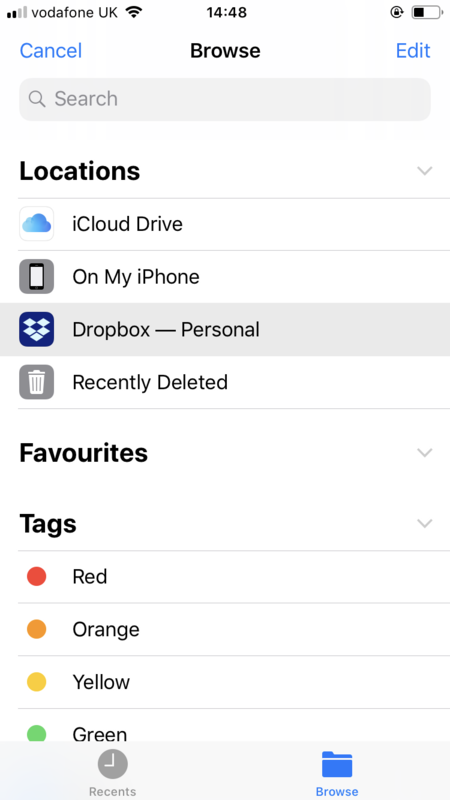 To edit a user, from the Manage users list, tap on the user to open a new edit user screen, here you can change the permissions and make them inactive or active. As well as getting paid by cash you can also choose to get paid using payment gateways, Stripe and Paypal. This keeps the whole payment process online and makes it easy for both you and your customer. Tap then tap on your company name for the menu and choose Integrations. Once you have selected Integrations, you will be taken to a screen with the option to connect to Stripe. Tap to be taken to the Stripe Account Activation form. You are then ready to go. Helpful tip: If you switch between Payment Gateways then you can also select your Gateway from Invoice settings within your new invoice (see Add Payment Gate section in this guide). Tap on connect my Stripe account and its all connected. Once you have selected Integrations, you will be taken to a screen with the option to connect to your Paypal account. Your client can easily pay you using their credit card or cash if you prefer. Once you have sent your invoice, your client will receive an email with a copy of the invoice attached. Your client then clicks on at the top left of the invoice screen and is taken to a dialogue box requesting payment details. If your client has Google or Apple Pay set up on their device then they can also pay these methods. You then receive a notification in the notifications bar that your invoice has been paid along with email confirmation. Your invoice is then automatically changed to Paid. If your client would like to download the invoice onto their computer, they simply click “download” on the top righthand side. If your client would like to send you a message, they can click on “Do you want to send a message or ask something else about this invoice?”, Fiskl will then send you an email, which you can reply to via email. 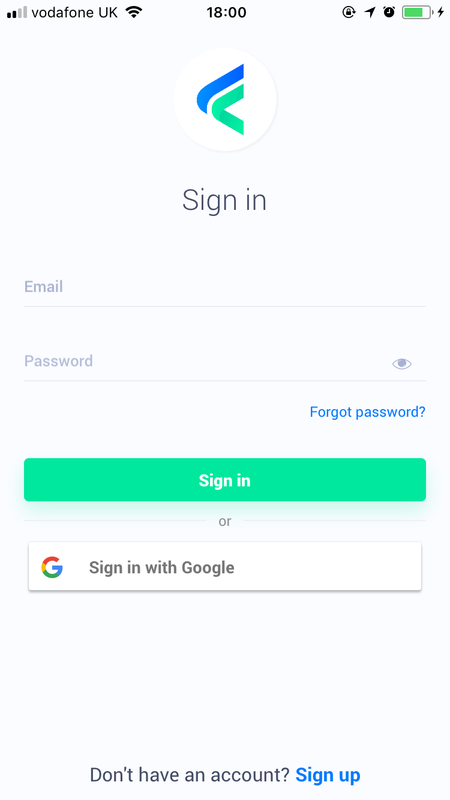 In User settings you can edit the user information you entered on signing up, change your password and sign out of the app. To access user settings, go to the user menu then tap . Once you have completed changing your user settings, press save. 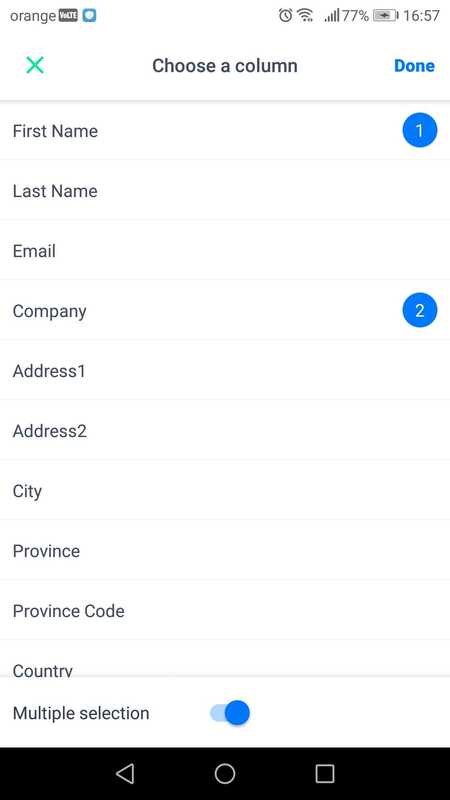 To edit your name, surname and phone simply tap on the relevant fields within user settings and press save. To change your email, within user settings tap on the edit icon , a pop up box will appear, change the email address, for security, you’ll also need to enter your current password, then tap save at the bottom of the screen. In Preferences you can customise what will be pre-filled throughout the relevant areas of the app, for example, mileage and time rates. To access your preferences, go to the user menu then tap on Preferences . You can save your preferences by tapping save at the top right of the screen. Mileage rate: This is your rate per mile/kilometre, the figure will always be the currency already pre-selected in company settings. Tap on the field to enter the rate. Billing rate: This is your standard rate for the time billed against your clients, this figure will always use the currency pre-selected in your company settings. Tap on the field to enter the rate. Billing unit: This will be autofilled with hours. Helpful tip: If you need to change your billing rate for a one-off project or client, you can do this as and when needed when creating or editing your time item within the app itself. If you need any assistance with using Fiskl, just tap on contact support within the user menu to chat with us on Livechat. Sign out of the app by going to the user menu at the top of the screen and tapping log-out. It’s easy to export your data from Fiskl to CSV or Excel. This then pulls up your Excel or CSV with all your data. It’s easy to import your Expense, Time, Mileage, Products and Services and Client data from a CSV or Excel file directly into Fiskl. Once you’ve selected your file, you can assign the column titles in your CSV to the relevant field and select add at the top right hand corner. If you would like to combine more than one column into the selected field, then simply switch the multiple selection to on and then tap on the required column names. You’ll receive a notification that your products have been added. You can then review your imported products in your Products list. Your day gives you a snapshot of your tasks/events or important notifications for the day, along with a calendar and list of the next 4 upcoming tasks/events. Tap on “Your day” within the sidebar, this will take you to a screen which shows your top 4 tasks, ability to mark as complete, add a new task, browse other tasks. Underneath this list is a month to view calendar which contains all events and tasks which have a date, it also shows a quick view of your next 4 events with the title and due time in days. This shows 4 tasks that you need to complete today or are overdue. Its easy to mark them as complete by tapping the selector button and the text will be struckthrough then deleted. Add new task: Tap on “add new task”, type details of your task in the open field. Helpful tip: To quickly add an event to your calendar simply press and hold the date within the calendar for the task popup screen to appear. Invoicing is a quick and easy way to bill your clients either by using the information you have already entered in Fiskl or adding fresh information for example a new client, product/service or an item such as an expense. It automatically creates an invoice PDF which you can email to your client from the app. It’s a great way to see all your invoices in one place along with the total amount of your invoices for the last 365 days with a breakdown of their status. Tap on the invoices menu on the sidebar to bring up the list of all your invoices. From here you can easily view the total amount of invoices for last 365 days, view by invoice status, search, view invoice, delete, send and create a new invoice. Search for an invoice: using your finger, pull down the invoice list to enable the search function. Apply a filter: By tapping on you can easily apply filters to narrow down your search. 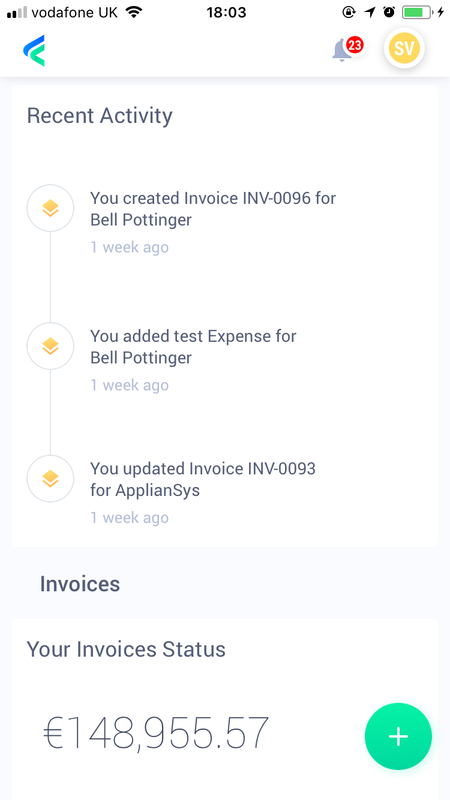 View your invoice list by invoice status: This enables you to sort your invoices by their status, just tap on the relevant tab to pull up the list. View an invoice: Simply tap on the invoice to preview the invoice PDF document. To delete, duplicate or send/re-send an invoice from within the invoice list: Swipe invoice item from the right towards the centre, “delete” “Duplicate” and “send” buttons will then appear. If the invoice has been paid, the option to send is available, if you wish to duplicate or delete then you’ll need to change the status of the invoice. To create a new invoice, tap within the Invoice list. Once you have opened a new invoice, tap at the top right hand screen to access your invoice settings. Here you can change your default language for your invoice PDF, change the total currency, select your payment integrations, change your tax settings and create recurring invoices. 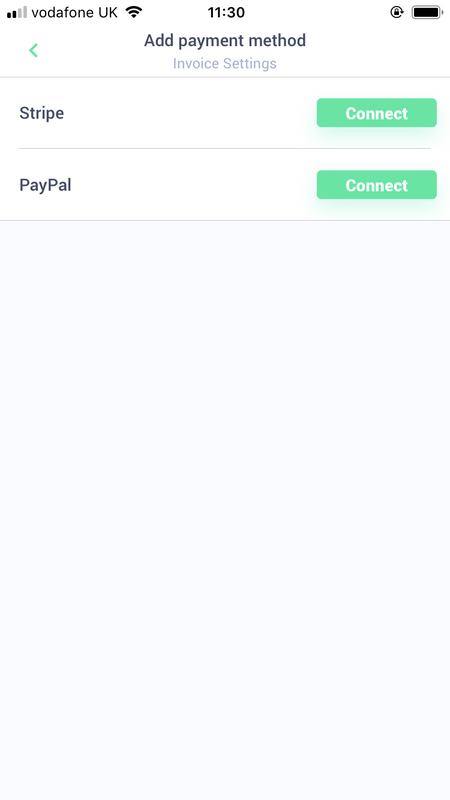 If you would like to add or change your payment method for your invoice, tap and select Add payment method, you will then have the option to connect to your Stripe or Paypal account. Helpful tip: You can add your default payment method by going to your Company menu and selecting “Integrations” (see Payment Integrations section within this guide. You may have already entered your default Tax settings in company settings, however it’s possible to also change this at invoice level. 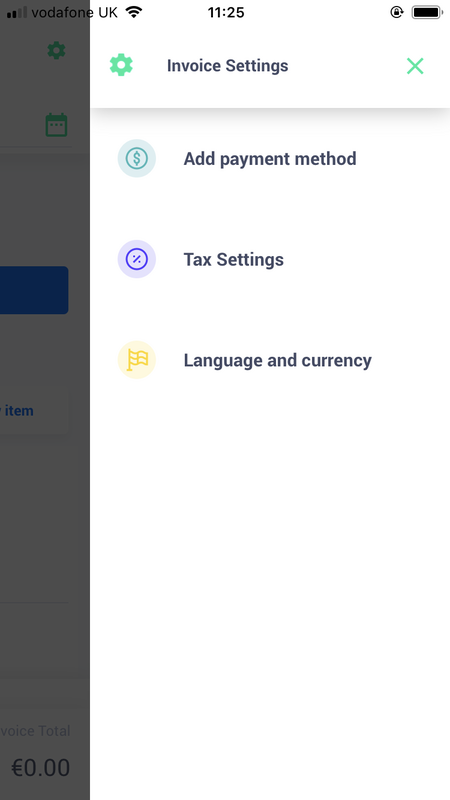 Click on the gear icon at the top of the screen to go to Invoicing Settings and select Tax Settings, here you can click on the drop down arrow to select your tax type. Add an item to your invoice, to apply multiple taxes simply click on “Add tax”, the following options will appear, for multiple taxes make sure Simple is selected, you can then add upto 4 taxes. If you wish to remove one of the taxes, click on the drop down arrow to select “none”. Once you have entered your taxes, click on the small text below the line item amounts and the drop down box will disappear. If once you have selected “Simple” from the drop down box you decide to change your tax type to Compound, then simply click on the “Compound” option and enter your taxes. If you wish to add a compound tax, simply select “Compound” from the dropdown box from the Tax settings menu, add your item to your invoice and click on Add taxes, and here you can add 2 taxes. If once you have selected “Compound” from the drop down box you decide to change your tax type to multiple, then simply select “Simple” and enter your taxes. If you would like to apply the taxes which are individually assigned to your line items, simply select Standard from the Tax settings option within the Invoice settings menu. If you prefer not to have any taxes in your invoice, select No tax from the Tax settings menu. The tax column and tax references will not appear on the invoice PDF. If there are items which you wish to apply tax to and you have already selected no tax, just edit the item and add the tax accordingly. If you have added a Multiple or Compound tax and wish to remove an assigned tax select the small text showing the name of the taxes the drop down box will appear, select “none” from the drop down box and the tax will disappear. You can use the same process for changing the taxes. In Fiskl, you can send invoices in 60 pre-set languages (see Available languages section within this guide), if you would like to switch between languages for your invoices then you can change it by going to Invoice settings within your new or existing invoice. Tap to bring up the list of 60 languages in addition to any that you may have already added or customised within Company settings, select your preferred language. Tap on Save and your language will automatically be applied to your Invoice PDF. Helpful tip: If you would like to add a new language or edit an existing one, simply go to Company settings (for more information go to Add and customise your invoice PDF language section in this guide). To ensure you receive your regular payments, set up a recurring invoice and Fiskl will do the rest. 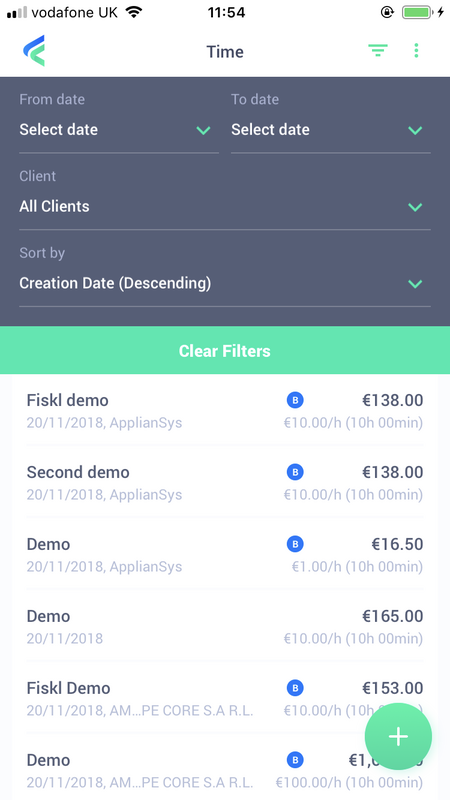 Fiskl can either create and send automatically or if you prefer, you can create automatically and you’ll receive a notification for when your new invoice is ready to be sent so you can make any changes and send manually. Fiskl will keep you automatically informed of when your invoice is sent and when the next one is due, so you’ll get paid quicker. To create and automatically send a recurring invoice, go to the invoice menu and press As soon as the invoice has been sent, the new invoice will appear as sent and your next scheduled invoice will appear with the date for when the next invoice will be sent. If you “paused” your recurring invoice and would like to schedule it, simply tap on the invoice from the invoice list, tap on start, this will then schedule it as planned and your invoice status will be changed to “Scheduled”. 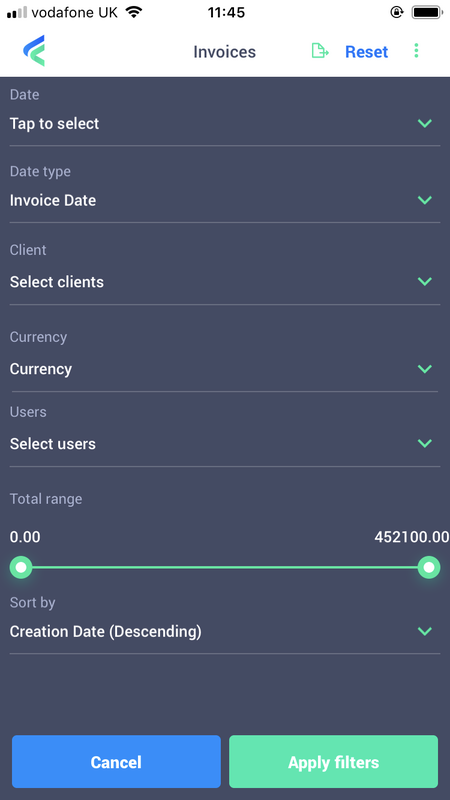 To set up a recurring invoice which will be automatically created for each recurrence but can be sent manually, go to Invoices in the main menu and tap to create a new invoice. Add a client and then tap on to go to Invoice Settings and select Make Recurring. Using the drop down arrow select how often you’d like this invoice to be sent (from weekly to yearly), if you choose custom then you’ll have a further option to choose your custom intervals. If your recurring invoice is ongoing then leave the checkbox against days remaining unchecked, however if you wish to stop the invoices after a certain number have been sent then check the box and edit the number. If you need to change the default email address or email text, tap on “Email info” for the email pop up box to appear, here you can customise your emails. Ensure that “Create draft invoices and send manually” is checked and press Save at the top right of the screen. This takes you back to the main screen, continue to create your invoice (for further information go to Creating a new invoice section in this guide). Once you have completed creating your invoice, you can either tap on “Save” this will save your invoice ready to schedule later (the invoice status will automatically change to “Paused”) or tap on Start, your draft invoice is then scheduled and you’ll receive a notification when the next one is about to be sent. Your invoice status will then change to Scheduled and when you tap on you will return to the invoice list where your invoice will be marked as Scheduled “Creating soon”. Your new invoice will appear in the list in “Open” status ready for you to send at your convenience. 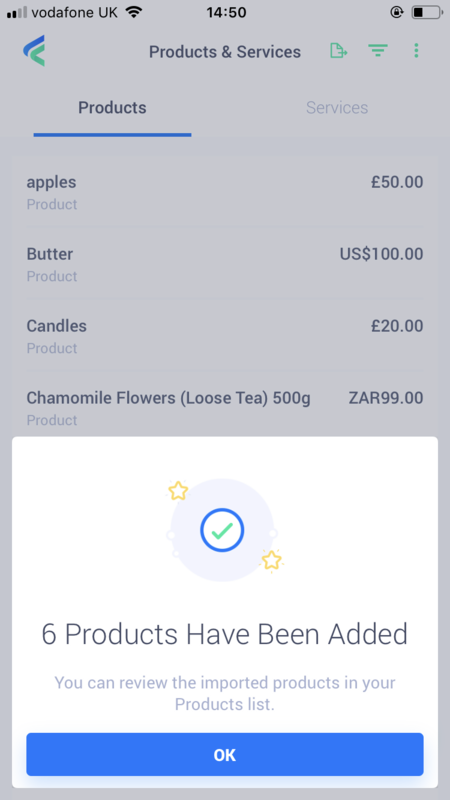 If you no longer need the invoice to be recurring, simply go to the invoice within the invoice list, you’ll be taken to the invoice preview page, tap on the padlock, to be able to edit the invoice. Tap on to go to Invoice Settings, select Make Recurring. At the bottom of the screen, select “Disable Recurring Invoice” and press save, this then returns you back to the invoice screen. Simply save the invoice to go to the preview screen and choose to either send to the client or press to exit the invoice without sending. To copy a scheduled recurring invoice, go to Invoices in the main menu, swipe left on the required invoice and tap on “Duplicate” which then opens a copy invoice, make any necessary changes and either “Save” to send later or “Start” to trigger the scheduled invoice. 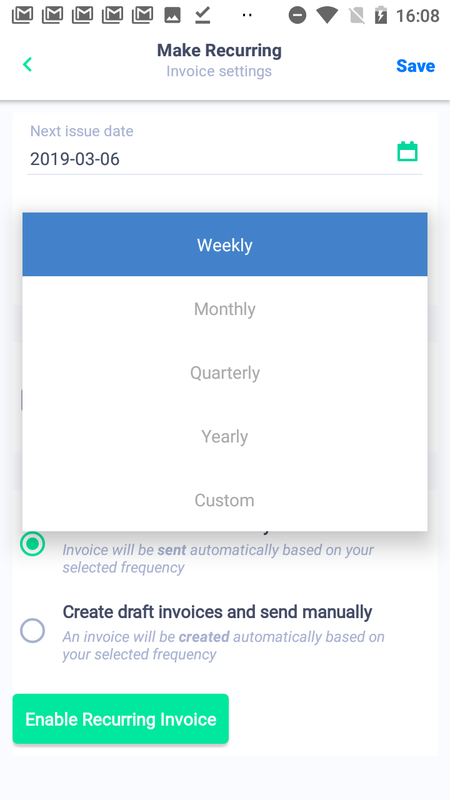 It’s easy to edit an already scheduled recurring invoice, simply go to invoices within the main menu, tap on the required invoice, at the top of the screen tap on the padlock to go to the invoice form and make your changes. From the new invoice screen, its easy to change your invoice number and/or name to make it easier for your clients to identify their invoices. Invoice name: To make it easier for your clients to easily identify their invoices you can change the invoice name to something more relevant. Once completed changing the number or name, tap on the edit icon to return to the invoice screen. Company: To change your basic company information, tap on the arrow to edit fields, scroll to the bottom to save or cancel your company changes. Just tap on the edit icon to return to the invoice screen. Invoice date: This can be the current, past or future date, by tapping on the calendar , select the date and press save. Invoice due date: This will automatically be set as per the payment terms you set in company settings, however if you would like to change this then simply tap the calendar to select the date and save. Sale date: Should you be required to show the date of the sale on your invoices, just select “sale date” and tap on the calendar to select the date. Helpful tip: To change or enter both invoice date and due date, simply tap on the invoice date calendar , tap on the required invoice date and then tap on the due date, all days in between will automatically be shaded, just save and both fields will be automatically updated. Bill to allows you to select your client or add a new one. 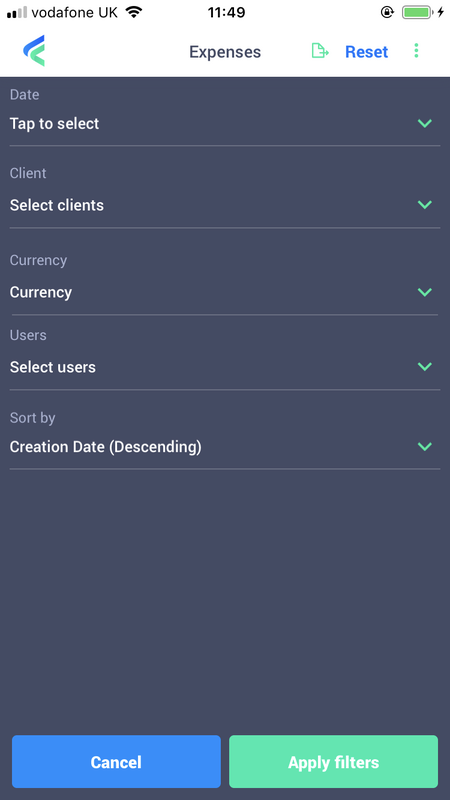 Select client or add new one: This pulls up the list of clients from your database, however if you need to create a new client, just tap either import your client information from your mobile or manually input the relevant client details (see client section in this guide for more details). To attach an item you’ve already created (ie product) tap “attach existing item”. This pulls up a list which is split into two, one for all your client items (such as mileage) and one for Products & Services. Here you can easily see the item type (ie expense), the name, date the item was created, total and where applicable the Tax/VAT amount. When you select an item, the amount is added to the Invoice totals at the bottom of this screen. Attach item: Once item/s selected either tap on “attach selected button” or if you change your mind just tap on cancel to return to your invoice creation. 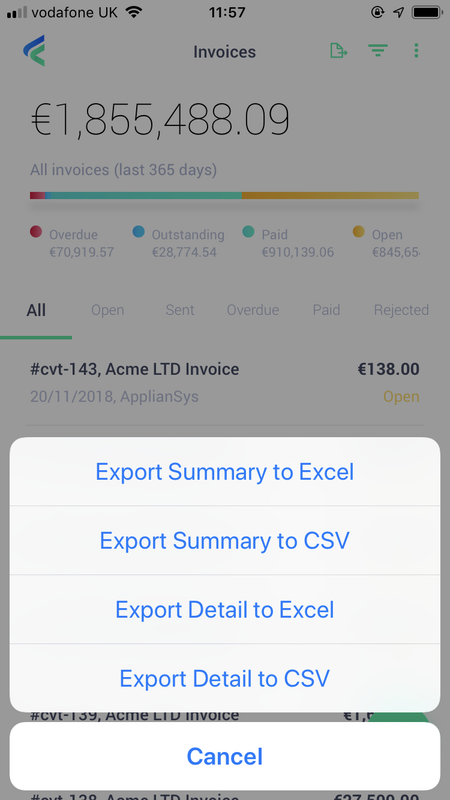 Edit an existing item: To edit an item which you have added to your invoice, just tap on the item within the invoice, it will open the item for you to edit and save your changes. Copy an existing item: To copy the item, on the line item within the invoice, swipe from right towards the middle, the duplicate button will appear. Remove existing item from your invoice: If you change your mind and no longer require a particular line item in your invoice, then simply, on the line item, swipe from the right towards the middle and tap remove. Tap “add new item” within your invoice, then the Product & Service icon to create a new product or service, this will take you to the add new product/service screen. Quantity: This is the number of items you will be invoicing the client. Price/rate: This is the price of the product/service per unit. Currency is selected by default using the information provided in company settings. To change the currency for this particular product, tap the currency button to select preferred currency. To enter the figure, just type over the existing amount without using a decimal place as this is automatically entered for you – for example, for £80.55 type 8055. Add tax: This is the tax type, ie, No Tax, Standard, Multiple or Compound which is to be applied to your invoice. To change your Tax type options, go to Company Settings (go to Setting tax types including Multiple and Compound section of this guide). To create a new tax, click the down arrow, a pop up box will appear, type the name of your new tax/VAT and the percentage. Press save, your new tax will be shown in your tax list going forwards. Description: This is an open ended text box for you to enter a description of your product. Unit: This is the unit of the product/service, for example, “Pack of 6 bottles” or for a single unit – “litre” or days/hours if a service. Tap on the “import photo button”, this takes you to your mobile photo album, select your photo and it’ll be added. Take photo, from here you can either re-take or use the photo, once you’re happy it’ll be added to your product details. To save your new product or service, tap Save at the top of the screen. This will save in your Products and Services menu too. To add a new expense to your invoice, firstly you’ll need to capture your receipts. You will be taken to the scanning screen which allows you to capture your receipt (single or multiple pages) using your device camera, import your receipt or simply skip photo to go straight to manually entering the expense. Initially you will be asked if you would like Fiskl to access your camera. to capture your receipts or if you don’t have any receipts, then simply press skip photo. The single page scan will be selected by default, therefore hold the phone over the entire receipt and Fiskl will automatically scan it. the scanned receipt will then be attached with the vendor, total and date auto filled. once you have all your pages captured, tap on continue at the top right of the screen. This will take you to the “Add new expenses” screen. To import a receipt: Tap on import icon at the bottom left of the screen , then choose the relevant photo/s from your device. This will then be attached to the “Add new expenses” screen. Tap on multipage at the bottom of the screen, capture your expenses by tapping the take picture button in the app and repeat for all required pages. 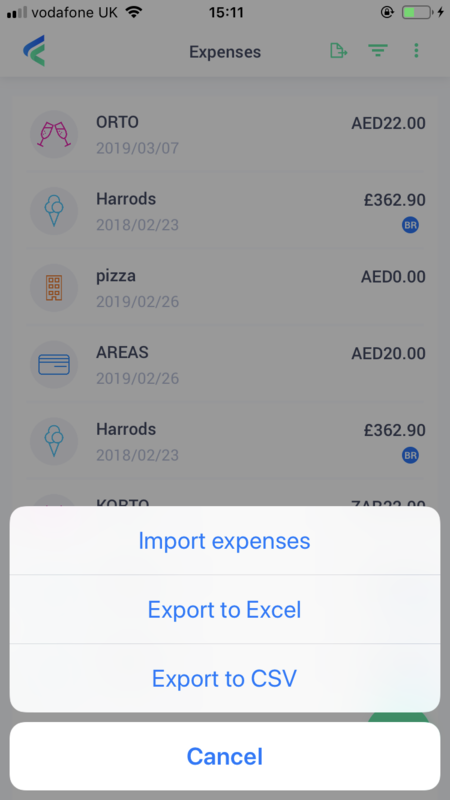 To import a receipt: Tap on the import icon at the bottom left of the screen , then choose the relevant photo/s from your device to attach to “Add new expenses” screen. Once you have attached your receipts or simply pressed skipped photo you will be taken to the “add new expense” screen, from here, you will see your receipt, or if your receipt has multiple pages then just slide your finger across the two dots to go between pictures. To see the scanned copy of the receipt in full then drag the green bar downwards. Vendor: The name of the company that sold you the goods. Automated taxes: Make sure your default tax type is set in Company Settings (see Set tax types including Multiple and Compound section in this guide). 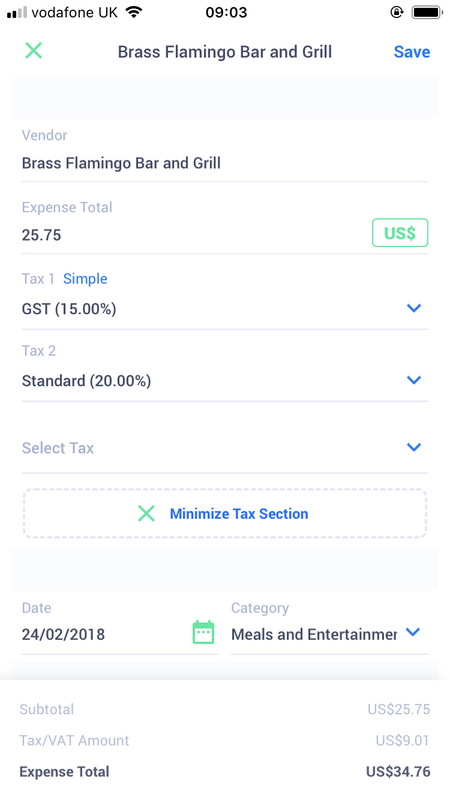 Fiskl will always calculate the taxes automatically simply tap on “Automated”, for your first expense, tap on “edit” to add your default taxes, you’ll then see the amount against each tax along with the subtotal. Fiskl will continue to use these automated taxes for all expenses going forwards. It’s easy to change your taxes simply by tapping on the down arrow next to the taxes. Manually add taxes: Add taxes manually if taxes are applied only to certain items or the expense has multiple tax types tap on “Add manually” and select your taxes. Date: This is the date of the receipt. Tap on the calendar icon select a date and tap save. Category: To help you identify where your money is being spent, tap on the down arrow to select a category relating to the type of expense. If you’d like to add a new category tap on Add new and enter the details. Reimbursable: Select the toggle button if your expense is reimbursable, this is off by default. Invoice Specific Tax: This is the tax type, Standard, Multiple or Compound which is to be applied to your invoice. To change your default Tax type for your current expense item, simply click on “Simple” or “Compound” to switch between the two. To create a new tax, tap the down arrow, a pop up box will appear, type the name of your new tax/VAT and the percentage. Press save, your new tax will be shown in your tax list going forwards. Description: This is an open field for a brief description of what the expense is and, if required, a justification. Use your current location: To enable this, initially you will be asked permission for Fiskl to access your location settings. By tapping on current location, the start field will be autofilled with your current address. Enter your address: Here you can enter your postcode or your address, the app will predict your address in the menu whilst you type. Select the correct address. Helpful tip: If you start entering your information but run out of time to finish it, then just tap “finish later” button, give it a name and save. You can come back later to complete the mileage form whenever you like. Under distance details, enter your odometer reading at the start of your journey and your end odometer reading, the total will automatically calculated using your readings. Date: This is automatically filled in as today’s date, to change it tap on the calendar icon , select date and save. Return trip: If you are taking a return trip, tap on the toggle to include the mileage for a return trip . Mileage unit and rate: This is autofilled from the information you entered in your preferences, to change it type in the mileage rate without including a decimal point (eg 5.00 type 500), if its a negative figure tap and tap on the km button to change the unit. Description: This is an open field for you to enter a brief description and justification if needed. Date: This date relates to the day for when the time was logged, by default, it’s today’s date, to change just tap on the calendar icon , select the date then save. This will be pre-filled using information you entered in user settings, to change it, simply delete the number and enter the new one (enter without decimal point eg. For £18.55 type 1855). Description: This is an open field for you to add a brief description of what you spent your time on. Take photo, from here you can either re-take or use the photo, once you’re happy it’ll be added to your time details. To remove or duplicate an item from within your invoice, swipe from the right towards the centre on the item, Duplicate and Remove buttons appear. To duplicate an item: Tap on duplicate, this will then open up into a screen with a copy of your item, here you can edit the details and save. This will add the new item to your invoice and will also show as billed in your main item list (for example a Time item will be added to Time in the main menu). To remove an item: Tap on remove, you will be prompted to confirm your request, this will remove it from your invoice but will not delete the item from your relevant item list. 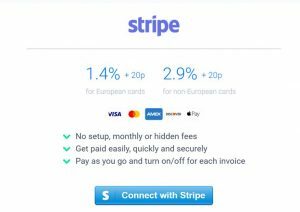 If you are connected to Stripe (see Payment Integration section for more information), the Stripe checkbox will automatically be checked giving your client the ability to pay by credit card. If you prefer to be paid by another method, for example, cash, simply uncheck the check box. If you haven’t already saved your payment information in Company settings then you can add your account details and payment terms here. It’s also possible to edit any information by just clicking in the field. If you have saved any notes for your invoices then this will be automatically prefilled with the information you provided in company settings, if you haven’t, then by default “Thank you for your business” will appear in the notes field, both can be easily changed by clicking in the field. To add or change a discount : Tap on edit, then simply tap in the discount field to change the amount, if your discount is in percentage, then tap the selector to switch to the percentage button . To change currency of Invoice total: Simply tap on the currency selector next to the total to choose your preferred currency. To save any changes you made in this section, press save or simply cancel to return to your invoice screen. Once you have completed your invoice, you can easily preview and send your invoice. To preview your invoice: Once you have pressed save, this will take you to a preview screen where you can see how your invoice will appear to your client. If you would like to go back to make changes, just tap on to go back to the invoice screen. To exit and return to your invoice list, tap on and your invoice will appear at the top of the list with an Open status. To: this will be pre-filled with the client details you entered when you added your client to Fiskl, this can be easily changed by editing the field. To add an additional email, add a space at the end of the first email and add the new email address. If you are a paid subscriber you can blind copy yourself or a colleague. Press send to send your invoice, your client will then receive an email which will appear in their inbox with your company name and will originate from noreply@fiskl.com email address. The summary of the invoice and the PDF will be attached. Your status will then be changed, just tap on to go back to the invoice list. In expenses, it’s easy to record the money you spend out of your own pocket for a business related expense, for example, buying a part for the service you are providing for your client. By using the latest scanning technology on your mobile, you can quickly capture your receipts and record your expenses wherever you may be. It’s easy to bill your expenses to your client and mark them as reimbursable. Tap on the expenses menu on the sidebar to bring up the list of all your expenses. This list shows the vendor, date, amount, whether it has been billed and if it’s reimbursable. From here you can easily search, view, edit, create, attach to an invoice, duplicate, delete and create a new expense item. Search for an expense: using your finger, pull down the expenses list to enable the search function. Apply a filter: By tapping on you can create filters to narrow down your search. View an expense: simply tap on the expense to view the details. Add to: this brings up a list of options: Add to new invoice or Add to existing. Add to new: opens up a new invoice with the item already attached (for details around invoices see invoices section in this guide). Add to existing: will take you to your list of invoices, select required invoice and the expense will be added, don’t forget to save your invoice (see invoice section for more info). To view a billed expense within the invoice: Swipe expenses item from the right towards the centre, “view in invoice” button will appear, which will then open the relevant invoice. 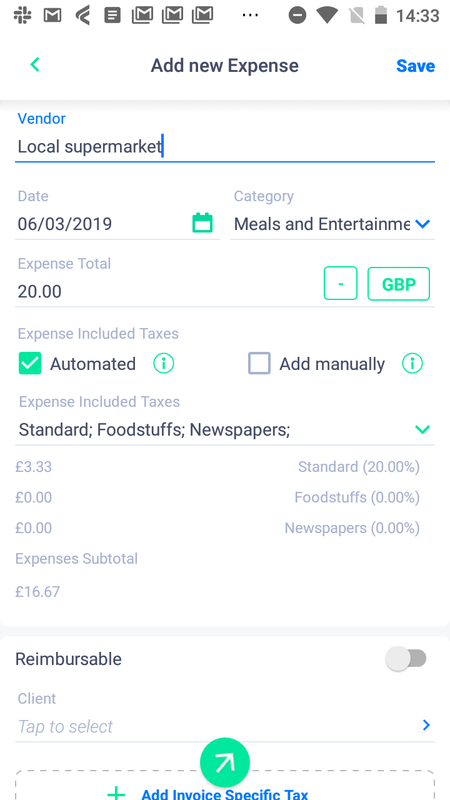 From the Expenses list, tap this brings up a screen allowing you to capture your receipt (single or multiple pages) using your device camera, import your receipt or simply skip photo to go straight to manually entering the expense. Initially you will be asked if you would like Fiskl to access your camera. From the expense list, tap , this brings up a screen to scan your receipt, if you haven’t done so already, you will need to give Fiskl access to your camera. Tap on multipage at the bottom of the screen, capture your expenses by tapping the take picture button in the app, repeat until you have all the pages you need. once all your pages have been captured, tap on continue at the top right of the screen. This will take you to the “Add new expenses” screen. Once you have attached your receipts or simply pressed skipped photo you will be taken to the “add new expense” screen, from here, you will see your receipt, or if your receipt has multiple pages then just slide your finger across the two dots to go between pictures. To see the receipt in full, drag the green bar down the screen. Category: To help you identify where your money is being spent, tap on the down arrow to select a category relating to the type of expense. 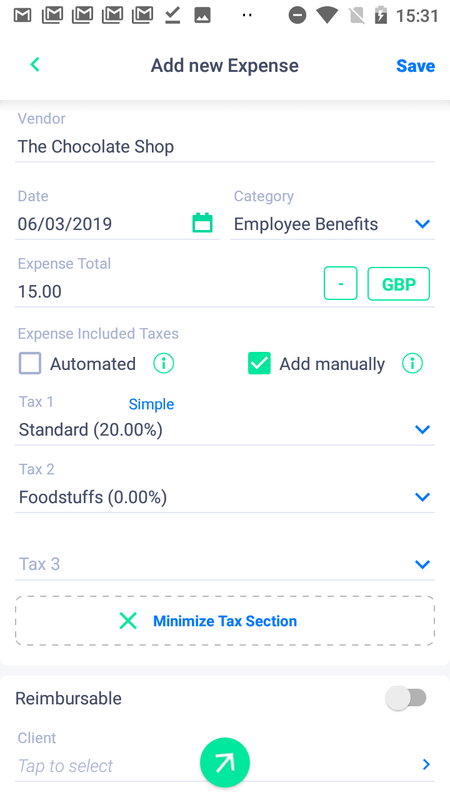 Manually add taxes: Add taxes manually if taxes are applied only to certain items or the expense has multiple tax types, tap on “Add manually” and select your taxes. Client: Tap the down arrow to select your client, if your client doesn’t appear in this list you can add a new one by pressing the plus icon (for more details around adding a new client, please see clients within this guide). Adding to invoice: Once you have completed all the required fields, you can add this expense to an existing or new invoice by tapping the attach to icon at the bottom of the screen. You’ll be prompted for Add to existing (goes to your invoice list) or Add to new (opens a new invoice screen). For more details on invoices see invoicing section in this guide. Saving and returning to the list of expenses, just press save at the top right of the screen. From the Expenses list, simply tap on the expense, change the required fields and tap save. if the expense has been billed, this is shown in the expenses list by or icon, from the list tap on view in invoice, your invoice with the expense is then opened. Tap on the edit icon to bring up the invoice screen. Tap on the Expense line within the invoice and make the required changes. The changes you make here will also be replicated in the Expense item within the Expenses list. Tap on the padlock icon to bring up the invoice screen. Tap on Time within the sidebar to bring up a list of all your time items. From here you can quickly start the timer, log the time, quick save it, plus you can also search, edit, add to a new or existing invoice, duplicate, delete and create a new time item. The list provides a useful graph displaying the amount of time you have worked this week, it also shows the name of the time item, client, total amount, price per hour, total time and whether or not it has been billed. Activate the timer, tap play button , time is recorded in hours, minutes and seconds. If you are in a hurry, to save time you can log the time and carry out a quick save. Your time is then stored so if you need to enter additional information you can do so at a later date. Client: In order for time item to be easily invoiced it’s important to add your client. This field is pre-filled with the last client you used, however to change this, click on the down arrow , you can either select an existing client, use the plus button to create a new one (for more details on adding clients see client section in this guide) or if no client, simply choose none from the list. This will be pre-filled using the hourly rate you used for your last time entry, to change it, simply delete the number and enter the new one (enter without decimal point eg. For £18.55 type 1855). Tap on “Quick save” button to save it to your time list. To search for a time item from within the Time list, using your finger, pull down the time list to enable the search function. Apply a filter: Tap on to apply filters to narrow down your search. View your unbilled time: Tap on the relevant time entry to open and view it. View a billed time within the invoice: swipe time item from the right towards the centre, “view in invoice” button will then appear. Add to: Not applicable to Time items which have been billed. Add to brings up a list of options: Add to new invoice or Add to existing. Duplicate: If you need to repeat this time for another day, then tap duplicate and it will bring up a new duplicate screen, you’ll need to change the name slightly to make it easily identifiable. Client: In order for time item to be easily invoiced it’s important to add your client, click on the down arrow , you can either select an existing client or use the plus button to create a new one (for more details on adding clients see client section in this guide). Add to invoice: Once you have completed all the required fields, you can add this time to either an existing or new invoice by tapping the attach to icon at the bottom of the screen. You’ll be prompted for Add to existing (goes to your invoice list) or Add to new (opens a new invoice screen). For more details on invoices see invoicing section in this guide. Saving your time item: Press save at the top of the screen to save and return to the list of your time items. From the Time list, simply tap on the time item, change the required fields and tap save. If the time has been billed, this is shown in the Time list by or icons, swipe left and tap on “view in Invoice” this will then open the invoice the Time item is attached to. Tap on the Time line within the invoice and make the required changes. The changes you make here will also be replicated in the time item within the Time list. Fiskl enables you to record mileage for any trips you take on behalf of your organisation. It uses the latest Google technology to enter your distances or you can add your odometer readings if you prefer. Tap on mileage in the sidebar menu to bring up a list of all your trips. From here you can easily view your open and completed trips (which are separated into two tabs), create new, search, edit, duplicate, delete, and where applicable add to a new invoice. It’s easy to see the name of the mileage, date, client, total amount, amount per unit with total distance and if its billable and/or reimbursable. Search for a trip: using your finger, pull down the mileage list to enable the search function. View a trip: tap on the item to open the trip. To duplicate a trip: Once you have tapped on “duplicate”, this takes you to a copy of the mileage, you’ll need to change the name of your trip. To delete a trip: Only mileage items which haven’t been billed can be deleted. Simply tap on the delete button, you will be prompted to confirm your request. To view a trip in the invoice: Swipe item from right of the screen, and select “view in invoice”, this takes you to the invoice which includes this mileage. Use your current location: By tapping on current location, the start field will be autofilled with your current address. Helpful tip:If you start entering your information but run out of time to finish it, then just tap “finish later” button, give it a name and save. You can come back later to complete the mileage form whenever you like. Return trip: If you are taking a return trip, tap on the toggle to include the mileage for a return trip. Client: This is your client that you are billing your trip to. Select the down arrow for the list of your clients, you can also add a new client if it doesn’t appear by tapping the plus button . For more details regarding adding clients, see clients section in this guide. Mileage unit and rate: This is autofilled from the information you entered in your preferences, to change it type in the mileage rate without including a decimal point (eg 5.00 type 500), if it is a negative figure tap tap on the km button to change the unit. To save: Simply press the save button to return to your list of trips. From the Mileage list, simply tap on the mileage, change the required fields and tap save. Tap on the mileage line within the invoice and make the required changes. The changes you make here will also be replicated in the Mileage item within the Mileage list. Products and Services is a great place to store all the details of the products you sell or services you provide to your clients. It also allows you to add them directly to a new or existing invoice. Tap on Products and services from the main menu to see your list of products/services, this list shows the product name, type (product or service), and price. The list of products and services is divided into two sections with a tab for Product and one for Service. Tap either the product or service tab, from here you can easily search, add new, duplicate, view, delete and duplicate your product or service. It’s also quick and easy to add your product or service to a new or existing invoice. Search for a product or service: using your finger, pull down the product/service list to enable the search function. View a product or service: Simply tap on the item to open it. Once you’ve tapped on “add to”, you’ll be prompted to select either new or existing invoice. To duplicate a product/service: Tap on “duplicate”, a new identical product/service form will appear, don’t forget to slightly change the name of your item and press save. To delete a product/service: Simply tap on the delete button, you will be prompted to confirm your request. Name: This is the name of your product. Unit: This is the unit of the product, for example, “Pack of 6 bottles” or for a single unit – “litre”. Price/rate: This is the price of the product per unit. Import photo: You can import a product photo from your phone (you will be asked permission for Fiskl to access your photos). Photos can be deleted by tapping on the delete icon . Take picture: You can take a picture and upload it directly into the app (you will be asked permission for Fiskl to access your camera). Simply tap on the “take picture” button, this goes directly to your phone camera. To save your new product, tap Save at the top of the screen. Helpful tip: You can add more than one photo by repeating the process for importing and/or taking a picture. When two or more photos are added, just swipe to the left to move between photos. Unit: This is the unit of the service, for example, if you are billing in hours then enter “hour”. Price/rate: This is the price of the service per unit. Description: This is an open ended text box for you to enter a description of your service. To save your new service, tap Save at the top of the screen. Helpful tip: This icon enables you to attach any item which you’ve just created (ie new service or expense) to an existing or new invoice. Just tap the icon, you’ll be prompted for Add to existing (goes to your invoice list) or Add to new (opens a new invoice screen). For more details on invoices see invoicing section in this guide. To view your product or service, tap on the relevant tab for product or service within the Products and Services list, then tap on the required item, this opens a new screen showing all the product/service information. To make changes, simply tap and edit the relevant fields. To save, press the save button at the top, or tap to attach to an invoice. The calendar section stores all your tasks and important meetings in quickly and easily in one handy place. Open calendar from the main menu to see your calendar, here you can view a week or month ahead, see your list of tasks, create, edit, mark your tasks as complete. From Calendar within the main menu , your tasks can be easily viewed below the week or month ahead. To view a month, click on the down arrow to expand the calendar. All tasks which are not dated will appear in “today’s” date. Create a new task: Tap the , you will be asked to enter a task name, a description and date if applicable. Delete a task: Either click on the task and it will automatically delete or swipe left and tap on delete. Helpful tip: Press and hold the date to quickly add your new task or event. Tap on the selection mark , a tick will appear with the text struckthrough, and then will disappear. Open clients from the main menu to pull up your list of clients, here you can use the search functionality to find your client, view, edit their details and add a new client. From the initial client list, tap , here you can either import one or more of your clients from your mobile contacts or complete the relevant fields in the screen. Helpful tip: You can also add, view or edit your client details as and when you create a new invoice, new expense, time or mileage. tap on the relevant fields to input your contact details. Not all fields need to be completed, only the client name and email are necessary. To save your changes, tap save at the top right. Either search (using the search bar), scroll (by dragging your finger up the screen) or tap on the alphabet on the right of the screen to find your client. Tap on your client’s name to view more details. This will then bring up their basic profile, which shows a total figure of the client’s invoices over the last 365 days along with a graph breaking down the status’ of their invoices. This screen also shows basic contact details. tap on to bring up their full details, the delete button can be found at the bottom of this screen. Once the delete button has been tapped you will be prompted to confirm your request.